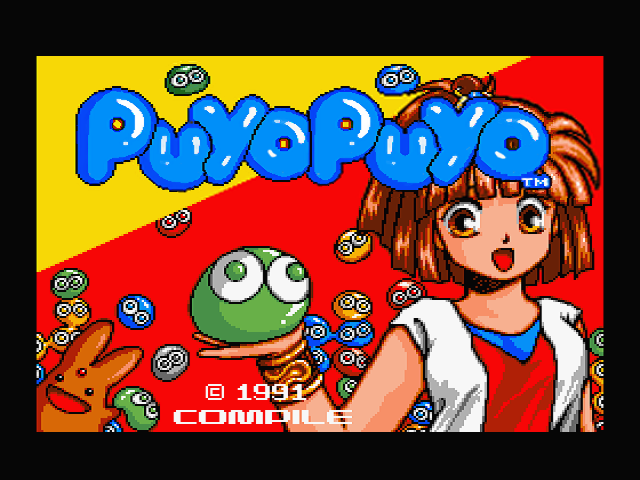 The popular franchise Puyo Puyo started on MSX2 and FDS simultaneously, but until now there was no English translation for the MSX2 version. This has now changed with this translation of MSX Translations and BiFi. No longer do you need to guess what you have to do in the 52 mission stages. The language barrier can no longer be the reason not to solve the puzzles in this game! Experience this great game in English with either everyone's favourite blobs from Madou Monogatari or even try the human puyo characters to mix things up. But now as Arle and Carby would agree, it's time to Puyo! - Full translation of all texts in the game. Nice work BiFi, I love these translations. Get's you involved much more in a game when you can actually understand what is said. Thanks for the translation. I have a question and a small comment to make. Why not have done the jelly effect that there is on the original ぷよぷよ? 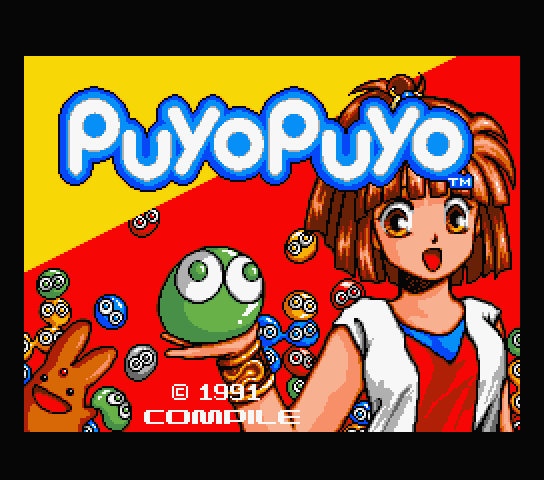 The title may be prettier if one of two blue Puyo-Puyo used as circle in original changes color. I suggest a fix for the english title screen because the two blue blobs are part of the Japanese title. Also, in my opinion, the anti-aliasing of the title should be further improved in the same way as the original logo, even better than what I'm proposing. Thanks for the feedback and the compliments! @GDX: the jelly effect and having the puyo animations be part of the logo was considered at first, like the puyo being part of the O or being the O. Puyo in the O didn't look that good. In the end it was decided to more tie in with the current logo. @KdL: yes it was clear the moving puyo animation are part of the Japanese logo and therefore it was first considered to make them part of the English one as well but that didn't look too good. It would have been a waste to remove such nice puyo animation so they are now just to spice things up. With regards to your alternate logo and suggestion about improved antialiasing: this will considered. Playing this addictive game again, made me realize Compile brought us many beautifull games on the MSX. They always looks nice, are fun to play and a lot of them have FM-Pac music. So I praise effort like these to translate them into english to make them even more enjoyable. Thumbs up guys. Whats next? Aleste gaiden in english? Gorbi's pipeline title screen in english? I made an example quickly not pretty and unusable as is but it shows the idea. Your title is less in the original spirit but is sober and more clear. As for me, I like the colorful. And people ? yes, I like the last one aswell. Nice work. Thanks for the translation and the Moonsound sound ! Your logo option also looks good. If you could make that blue version based on a raw openmsx screenshot it will be implemented as an alternative title screen for those who prefer it. OK, give me your raw image so that it can be modified in the same way. (*) Tip: create a new picture 560x480, copy/paste the blueMSX screenshot at position 8,0, then color the left and right borders in the appropriate color (here, it's black) ! I belive this is a very long and complicated process. And still far from original MSX2 256x212 screen size. @GDX: I can dump for you original MSX2 screen with exact same palette in BMP format that you can edit and color numbers will match original MSX2 colors, so it can be just used to put back in MSX2 game. I don't know the original color palette. Are below PNG images suitable for you? The size is 256x192 and the colors are indexed (16 colors). Otherwise give me your raw image. PS: Please make also the colored version as alternative title screen! I prefer the way compile would have created it for the non-Japanese market. So like the original, but then in Roman characters. I remember I was very addicted to MSX and Mega Drive versions. Puyo Puyo is one of the best Tetris-like games. @gdx: the images were correct. The blue one is probably gonna made as the main title but might take some time due to RL. @gdx: your two versions have been added to the game. Your blue version is the default now and the rainbow version is an alt version. As is the logo from the first version of the release. please download again if you prefer the other title screen(s). Just a litle note. In Generation MSX, you can read a Tip which says if you keep pressed the keys [GRAPH] in tittle screen you can see the staff list. I'm not sure if it's KEY GRAPH or the letters and signs [GRAPH]. With the key Graph nothing happens, but with letters and signs [GRAPH], in not patched game you can see a japanese message. In your patched version you can read: "That is the wrong disk". You need to press the ESC key in the title screen to show the staff. Cheked! Thanks Randam. And what about "That is the wrong disk"? Does anyone have an idea of this? Good job! Thank you Randam. Works fine on my Turbo R FS-A1ST (upgraded to 512kB) using SofaRunit. The game works fine, but, have you tried the combination game that I said? What CRC's number game are you using for patch the game? I patch the game with English patch, Rainbow patch and OPL4 patch. Thank you so much for this awesome translation!